KnottyMouse said it best. She calls it Lace Lessons. 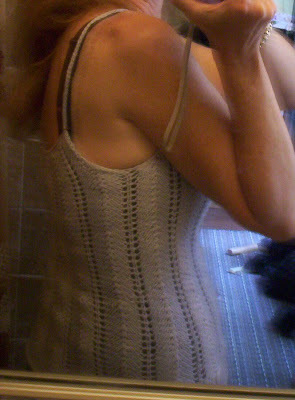 I call it Lace Credo. Thanks to shadkitty for pointing me in the direction of her wisdom. And for that matter, shadkitty has quite a bit of wisdom herself! 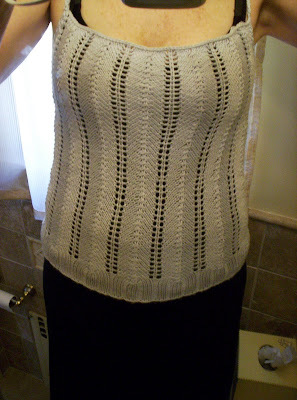 So here's a bit of lace, deceptively easy, but so easy to mess up too. 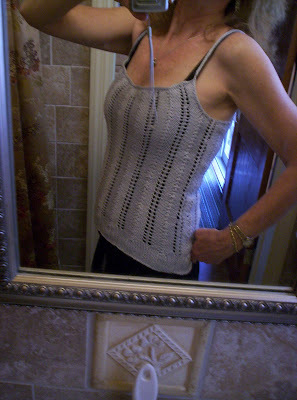 As with many others who have come and knit before, I decreased a bit before I put on the straps. 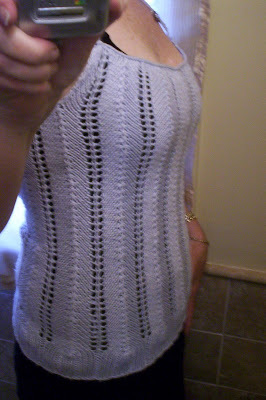 I left the pattern pretty much as is otherwise, because I'm a purist in that sense and felt that any deviation (like ribbing at the top) was detracting from the designer's intentions. The straps will probably need to be shortened because I didn't realize how much the cotton would stretch. Figures, I did a nice Kitchner on them too. "Don't You Wish Your SP10 Was Great Like Mine!"